Katsuie was born in the village of Kamiyashiro(present-day Meitō-ku, Nagoya), a branch of the Shiba clan (who descended from the Ashikaga clan, and were the former suzerains of the Oda clan). 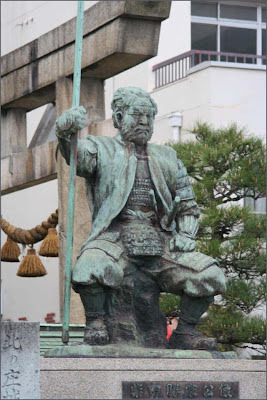 Note the differences between Shibata (柴田), Shiba (斯波), and the Shibata clan of Echigo (新発田).
. . . 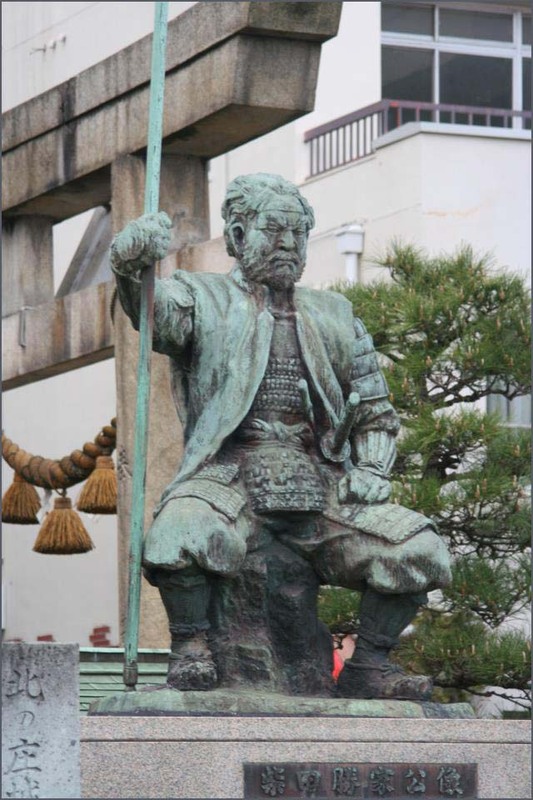 In 1575, after gaining control of Echizen, he took command of Kitanosho Castle (Hokujō) and was ordered to conquer the Hokuriku region. 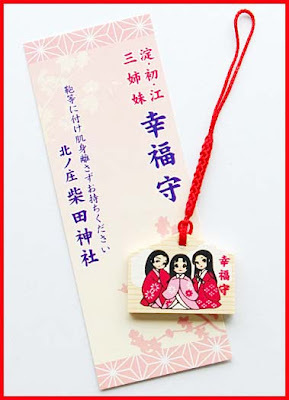 He married O-Ichi　お市, sister of Oda Nobunaga and took care of her three daughters. 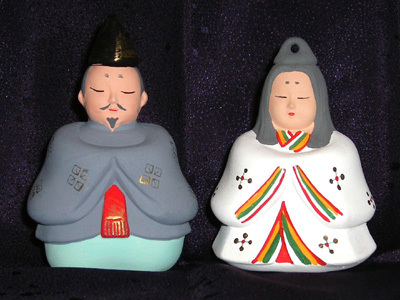 Yodo-dono, Ohatsu and Oeyo (O-Go). Following Nobunaga's conquest of Mino in 1567, in an effort to cement an alliance between Nobunaga and rival warlord Azai Nagamasa, Nobunaga arranged for Oichi, then twenty years old, to marry Nagamasa. Their marriage was through political means, ensuring an alliance between the Oda and the Azai clans. Nobunaga requested that his sister be returned to him before the final attack. Nagamasa agreed, sending out Oichi and her three daughters. Nagamasa had no hope of winning, and chose to commit seppuku. Nobunaga's third son arranged for his aunt Oichi to marry Katsuie in order to ensure his loyalty to the Oda clan. As Hideyoshi's army lay siege to the castle, Katsuie implored Oichi to flee with her daughters and seek Hideyoshi's protection. Oichi refused, insisting on dying with her husband after their daughters were sent away. The couple reportedly died in the castle's flames. 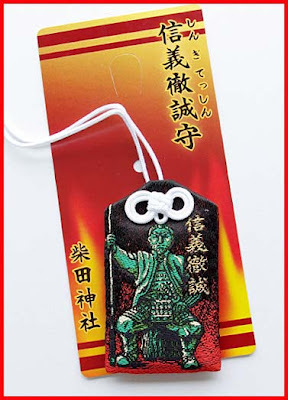 Amulet for good luck with children. 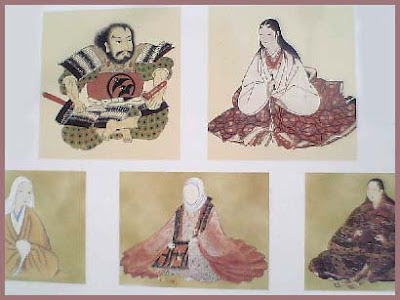 Depicting the three daughters of O-Ichi. There is a special shrine for the Three Sisters in the compound. In 1583, Katsuie lost a battle against Toyotomi Hideyoshi (豊臣秀吉). He committed seppuku and set the fire to his castle, Kitanoshō Castle, which was once located here, Shibata Shrine (柴田神社), Fukui.